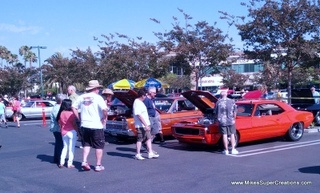 StoneBridge Community Church of Simi Valley hosted a Car Show, Saturday, May 18, 2013. The turn-out was good for this small in town show. Facilities were great, as it was held in the Town Center Mall Parking lot. I was able to stretch out by walk through the outdoor mall, and had a panini at the CornerBakery. Then, I was again fortunate to receive the honors of Best Modified 1960-1969. I can't express how happy I am with this car. The people seem to equally love it... especially when they realize it is not a Camaro! Here are some snapshots of the show... and a video of me having some fun on the way home.